Italians have no greater love than the love of wine and food. In the castle-filled land steeped with history and rich in culture, where Puccini’s beautifully melodic La Bohème and Michelangelo’s Renaissance masterpiece David reign supreme, it is Italy’s gastronomic specialties that draw many visitors to this beautifully diverse region. I, for one, was drawn to Italy by the allure of black truffles, the seemingly endless flavors of gelato, and of course the unmistakable vino! Visiting Italy in July is, well, much like being in New Orleans in July, weatherwise that is. Although it was rather warm during my recent trek through Tuscany, there was no shortage of refreshingly crisp wines available to quench one’s thirst, and with a gelateria on virtually every street corner, the intense heat was merely a convenient excuse to indulge. The first and most important discovery we made is that we all truly adore Italian wines, much more than we had realized. Prosecco, Italy’s version of champagne, is a delicate, crisp, delightful sparkling wine (made from a grape bearing the same name) and one that not only made several blisteringly hot days bearable but made them rather remarkable. This elegant, effervescent wine quickly became our official “start of every meal” wine as well as our “midday, thirst quencher.” Tasty and affordable, I definitely recommend trying Prosecco then next time bubbles are in order, which of course is always! We also learned that while Italy is traditionally noted for its rich, robust red wines, they also produce some very interesting, quite delicious whites. Italian whites have continued to gain attention from wine enthusiasts over the past few years as young, up-and-coming winemakers are experimenting with unique blends and winemaking techniques. 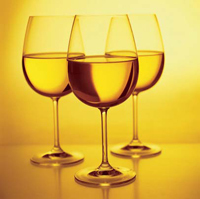 Also, better technology has led to better Italian wines, particularly in the white-wine arena. There are far too many Italian white grape types to mention, and in all honesty, most of us will never see many of the truly local varietals, as few are exported. Generally speaking, most whites from Italy see little or no oak aging, so they tend to be delicate, crisp, and refreshingly dry, making them the ideal aperitif or perfect to enjoy with seafood, chicken, and lighter cuisine. Another reason to check out some of the less familiar whites from Italy is their price point. Most retail for about $10-$20, so there are bargains to be found. Arneis—This native of Piedmont yields a crisp, aromatic, distinct wine with interesting aromas of stone fruit, pears, and almonds. Cortese—Grown in the Piedmont and Lombardy areas, it is used to produce wines labeled Gavi that are typically crisp, elegant, and delicately scented with hints of acacia and citrus. Garganega—Widely planted throughout the Veneto, this varietal is the primary white vine and the staple ingredient of Soave. It is capable of producing highly textural, delicate wines with excellent structure and balance. Greco di Tufo—Believed to be one of the oldest grape varieties in Italy, it was originally indigenous to Greece. It produces a wine of the same name that is straw yellow in color and is delicate, dry, and harmonious with notes of citrus fruits, peaches, and almonds. Malvasia Biancia—A white grape that shows up in all corners of Italy with a wide variety of clones and mutations, Malvasia offers spicy perfume and peachy fruit with nuances of musk and almonds and a tinge of acidity on the finish. Moscato Bianco—This one is grown primarily in Piedmont and used mainly to produce the slightly sweet, effervescent wine Moscato d’Asti. It has a unique aroma of exotic, fresh tropical fruits, rose petals, and citrus blossom. Pinot Grigio—Know at Pinot Gris in France, Italy’s most commercially successful white grape is characterized by its crisp, clean, fresh nature. Although these wines can range in style, common characteristics include citrus fruits, mineral, honey, flowers, and smoke. Tocai Friulano—A Venetian vine, possibly native to the Friuli-Venezia- Giulia region, its wines are elegant, fairly full bodied, and marked by delicate flavors and aromas of apples, citrus fruits, minerals, and fresh flowers. Trebbiano—Called Ugni Blanc in France, it is believed that Trebbiano produces more wine than any other grape in the world, as it’s traditionally used as a blending grape. One Trebbiano-based blend worth seeking out is Orvieto, which is delicate, fresh, and clean with floral and herbal qualities. Verdicchio—Cultivated in the Marches region of east-central Italy since the 1300s but virtually nowhere else, it yields a pale, straw-colored wine with lively acidity, peach flavors, and scents of citrus, almonds, and fresh herbs. —This grape is most widely known for its part in the production of Vernaccia de San Gimignano wine, the first wine to be classified as an Italian D.O.C. in 1966. It is usually a well-made, finely structured, crisp wine with delicate aromas and flavors reminiscent of citrus fruits, flowers, and almonds. A soft, delicately fruity wine with notes of fresh apples and pears, this 100% Arneis wine has fresh, clean fruit flavors and low acidity with an elegant, refreshing finish. Aromas of fresh peaches and lime zest leap from the glass of this mediumbodied, rich wine that displays lively flavors of tangerine and tangy green apple. Not your typical Pinot Grigio, this complex wine offers lovely aromas of rose petals, apricot, anise and a hint of spice. Elegant yet full with great balance, this wine’s ripe peach and apricot flavors precede a spicy, lingering finish. Made from the Gargenga grape, this Soave is well balanced and round with lovely scents of pear, citrus, and white flowers and rich tropical fruit and nutty flavors. This bright yellow wine is incredibly well structured and harmonious with aromas of peach, melon, and almond and a tinge of fresh mint and white pepper. Rich and complex, it offers flavors of apples, almonds, and minerals. This crisp and elegant Trebbiano-based white has bright citrus fruit aromas and flavors and offers an interesting tinge of minerality.